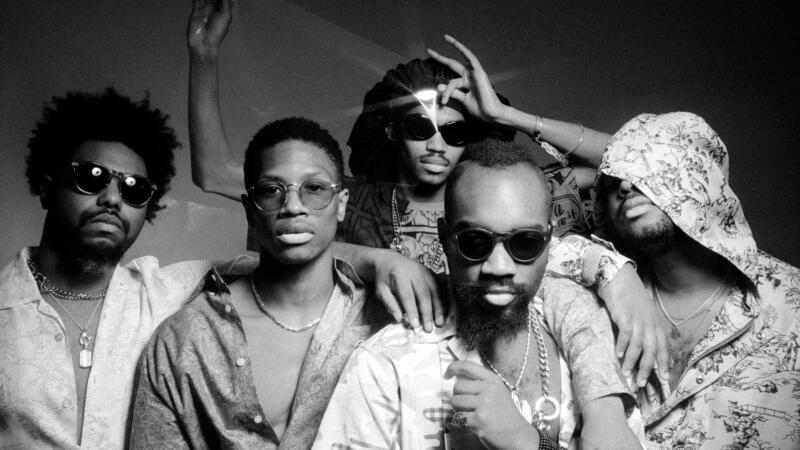 Phony Ppl has grown a lot. Three years removed from the band's last album, Yesterday's Tomorrow, the five piece has undergone a lineup change, inked a deal with 300 Entertainment and refined its genre-jumping sound. Now, the Brooklyn-based group of friends returns with mō'zā-ik. Glimmers of jazz, funk, bossa nova and even a little kompa matched with loose, playful songwriting are what make this recording shine. And almost every song on the 11-track offering sounds like it could have been an everlasting jam session if sufficient studio time was allowed. As the band members tell it, the music on mō'zā-ik is four years in the making. Some songs on the project were written in pieces before Yesterday's Tomorrow; some were written for other acts entirely (keyboardist Aja Grant tells NPR Music that album opener "Way Too Far" was almost a BTS song); and some evolved from live sets at its longstanding gig at New York's Blue Note Jazz Club. 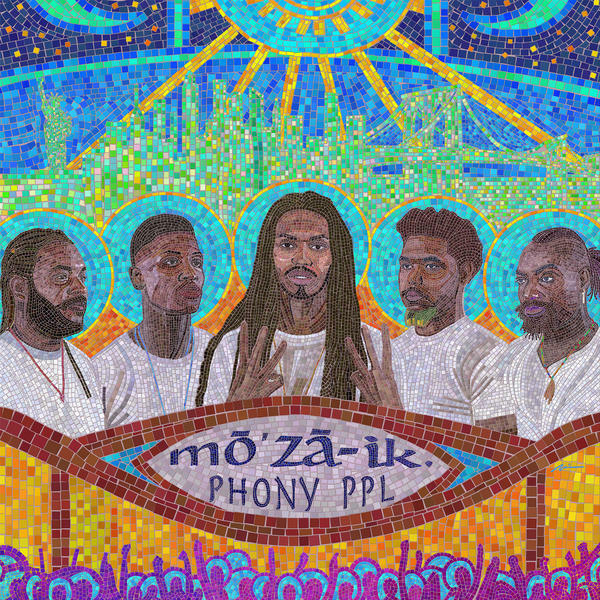 But after reaching "an invisible bar of satisfaction" for every member in their final form, all of the tracks are meant to represent Phony Ppl's artistic growth. Guitarist Elijah Rawk says the album's cover art is meant to evoke the tile artwork found in many of New York's subway stations and the album title represents a collage with each song standing out in its own own way. "It felt like going into a museum with each song on it being its own exhibit all on the same floor," Rawk tells NPR Music. "But every room you walk into has a different color scheme, a different smell, a different everything about it." Mō'zā-ik remains consistent with what Phony Ppl fans love most about the outfit; saxophone serenades about love at first sight ("Before You Get A Boyfriend" or "Once You Say Hello" featuring Masego), poppy romps on the emotional seesaw of relationships ("somethinG about your love") and subdued tunes about having 20/20 hindsight ("Cookie Crumble" featuring Braxton Cook). But oddly enough, the nexus of mō'zā-ik doesn't come until the album's final track, "on everythinG iii Love." Over somber guitar and piano, vocalist Elbee Thrie sings from the point of view of a black man shot by police. He dies on the pavement, but his soul witnesses the aftermath from the afterlife. The candor and building musicality of the track could fit in with a playlist after Marvin Gaye's "Inner City Blues (Make Me Wanna Holler)." "Still I went to all the hearings / As the ghost they couldn't see / Wonderin' if they'd honor me," Thrie sings. "It's a lot, but it's real and this happens everyday," Thrie says when explaining the song's message. The members go on to describe how, for years, when they would meet up in Brooklyn to practice, they'd always share news of the most recent act of police brutality in their neighborhood. "It was just that same story piling up onto itself," Thrie says. "I think one particular one couldn't have made us feel like that, but we're pretty fed up. Sometimes unfortunate things happen. But when it starts to become a thing and there's a name for it — police brutality — that's an issue." Clocking in at 43 minutes, the ride of mō'zā-ik serves as a stepping stone for the Brooklyn band as a subconscious vacation for the listener while moving through the world ... or maybe even a retreat from it.